WildCare’s Young Adult and Community Service Volunteer Programs enable young people to be proactive in environmental endeavors. High school students ages 14 -18 will work with our camp teachers to provide fun and exciting nature and wildlife experiences for younger campers. You will help with craft projects, hikes and games, and you will gain valuable experience working with children while earning community service hours. Being a Summer Nature Camp Assistant is a challenging, rewarding experience that you will carry with you the rest of your life. This program is designed for students aged 14 to 18 years old who enjoy nature, wildlife and working with children. Volunteers assist Camp Naturalists with activities, crafts, games, hikes and other nature explorations. WildCare Nature Camps operate from 9:00 am to 3:00 pm, Monday to Friday, although Assistants would be required to work from 8:30 am to 3:30 pm. Camp is conducted from early June through mid-August. 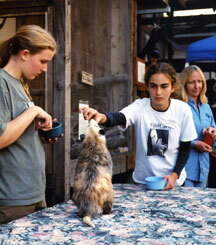 The majority of camps are held on-site at WildCare, but one or two days are spent at various hiking sites around Marin County. The minimum commitment is a week, one camp session, about 35 hours, however, you may request to work at as many camps as they would like. We accept a limited number of Summer Nature Camp Assistant Volunteers. All prospective Nature Camp complete the required Summer Nature Camp Assistant Application Forms. Young Adult Community Service Volunteers must be 12 years old by the Community Service Volunteer Orientations (next orientations will be in early Spring 2020) and be accompanied by a parent or guardian during the orientation. During a normal shift, they will find themselves doing animals’ laundry and dishes, sweeping and mopping floors and removing garbage and recycling. Community Service Volunteers are not allowed to handle wildlife patients, however, they provide an extra pair of hands to the regular hospital volunteers. If, after attending orientation, you decide to volunteer, you will pay the $50.00 training fee (fee includes a year’s membership to WildCare and covers the required trainings). Community Service volunteers must attend 2 classes (a full 3 hours) of hands-on training for the wildlife hospital. Community Service Volunteers must commit to one 1.5 hour shift per week for two months (Minimum commitment is 13.5 hours). Community Service Volunteer opportunities are scheduled for 2-month periods. We accept a limited number of Community Service Volunteers; please take your commitment seriously. Teen Hospital Volunteers must be at least 15 years old by the Hospital Volunteer Orientation date(s) of the upcoming session and must be accompanied by a parent or guardian at the orientation. Additionally, incoming volunteers must attend four classes (a full 16 hours) of hands-on training for the wildlife hospital. 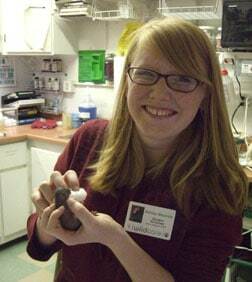 Teen Hospital Volunteers ages 15-17 must commit to one Wildlife Hospital Volunteer shift per week. Shifts are between 1.5 and 4 hours long, adjusted during the school year. The minimum commitment is from February through the end of WildCare’s “baby season” (usually ending late November). (Minimum commitment is 106 hours in 10 months). For more information and to complete a New Hospital Volunteer Registration Form click here. When young people ask how they can help the environment, they are so often given vague suggestions such as: recycle, learn to appreciate nature or join a nature organization. Although these are excellent suggestions and should be followed, it is often a more tangible endeavor the students seek. WildCare offers that experience. Middle school and high school students go home after a volunteer shift at WildCare dirty, tired and rewarded. Young Adult Volunteer programs at WildCare educate and inform students of the plight of wildlife and our environment. Students see first-hand the results of humans’ direct and indirect influence on Marin’s native wildlife, both negative and positive. What is more important, these programs cause the student to think and question our attitudes toward the environment, perhaps developing possible solutions. Working at WildCare empowers students with their ability to affect change. On a more individual and personal note, the program increases self-confidence and self-esteem. It challenges the young adult and strengthens teamwork skills. 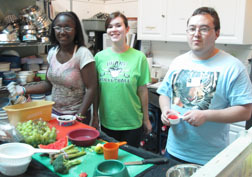 WildCare’s Young Adult Volunteer Program also creates a unique bond between adults and young teens. Students ages 12 through 18 work side by side with adult staff and volunteers to help wildlife and the environment through wildlife rehabilitation and nature education. All of the duties they perform are essential to the overall success of WildCare’s mission.